The way we remember is changing. And that includes the way we remember our vacations. When we were kids, we’d buy a postcard, scribble in our journal, snap a photograph on film, or just tuck a memory away in our minds, brushing the dust away on cold and grey days to try and feel the light of the South Strand summer sun again. Now we Insta this, tweet that. Post a status, post a blog. We’re exchanging memory for megapixels, and feel that somehow that’s enough. The haziest memories come alive when we smell that one flower, or hear that particular song; hold that seashell in our hands; or glance at the memento on our shelf. They make sense, those senses. And it’s why we still love a good souvenir. The Pawleys Island area has a few great places we love to find that ultimate something to capture the lightness, the freeness of your South Strand vacation — and all within minutes of Litchfield Beach & Golf. Pawleys Island Mercantile: This place is a favorite and for good reason. In addition to their tons of beach-and-beyond-appropriate apparel and footwear, PIM carries accessories such as hats, bags and jewelry. We love clothing as souvenirs since you’ll get a vacation flashback every time you don your wares — and get to talk about it when someone stops you and says, “I love your ___. Where did you get it?” If it’s a smaller item you’re after, insulated tumblers, glasses, magnets, sand art, dishware, decorative accessories and more will keep you ogling for hours. Also not to be missed is its Candy Cottage where you’ll find (yup) candy as well as great kids’ toys and mementos. PIM is in Hammock Shops Village. Harvest Commons: OK, this place is really cool. Picture a craft and gift trade show specializing in handmade, unique, Lowcountry-flavored goods … now picture it here to stay and open to the public. This is Harvest Commons. 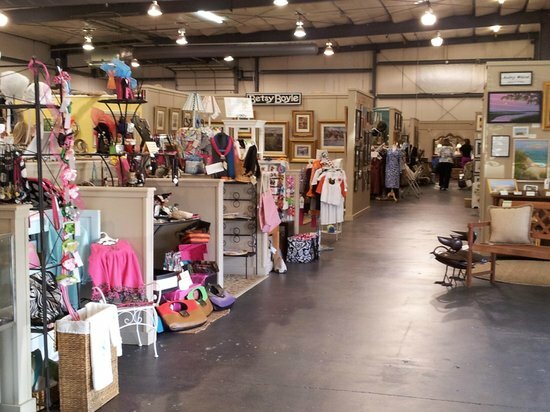 Eminently digestible and infinitely interesting, the large showroom-type space is filled with booths of local craftspeople, designers, artists and photographers selling their handiwork. Entrepreneurs share the overhead costs and customers get their pick of the local talent litter. We love coming here if we’re in the market for something bigger than a tchotchke but smaller than a kayak — think a fine art print, a candle or fabulous necklace. Dozens of boutiques in all, you will not want to leave. Boutique options are always changing. Barefoot Elegance: We’re back at the Hammock Shops and frankly, we may never leave. This shop carries high end clothes, accessories and gifts for women and children, but it’s the gifts that have us thinking about Pawleys Island memories. Candles and vases, cute signs and placards, serving ware and picture frames — everything is fun and in a riot of color. We love a funky pair of flip-flops as a souvenir, because what says “beach vacation” more than that? And they have a huge selection. Murrells Inlet MarshWalk: Here’s the nontraditional option. You have to spend at least one night in nearby Murrells Inlet, meandering down the beautiful walkway, swaying to the live music and sipping on something deliciously strong. Drink and food vendors as well as restaurants and bars along your path all have some sort of memento to sell and it’s hard to resist them. Be it a shot glass or a t-shirt, these options won’t break the bank but they will keep the moonlit memory alive… long after the next morning’s headache subsides. And we weren't kidding about Hammock Shops Village; you need to go there. It has something for everyone — truly. What’s your favorite place to shop for souvenirs near Litchfield?